Use Case: running git branch -a on my local repo shows remote branches which have been already deleted in the remote. This fixes the information that local has about the remote. Now git branch -a will return the correct information about remote branches. Use Case: I went to a version of one file from one branch into the branch I'm working in. Cannot start java web application in STS (tcServer, Tomcat). This error occurs when starting a tcServer. I have been able to fix this problem by running "maven clean" and "maven install" from STS and then restarting the server. Lately I've been programming with a mid-sized group of developers. We are working on Windows for our development environment. Using subversion for source code control and maven for our build process. Because we have enough developers that there are code check-ins almost 24x7 it is important that other developers update their local code every day. For a few days I had been manually updating the code from our repository by using TortoiseSVN and then running a command line "mvn clean install". Although this only took a few minutes to do each day I decided to write a batch file to automate this process. Now the cmd window stays open after this completes. I simplified the process for updating to the latest code and doing a local build. Normally I have a shortcut to DailyUpdate.bat in my windows startup directory so that it runs every time I start up my machine. There are some weeks where I don't want this running on startup, in that case I remove the shortcut. I have recently used Simplenews module to publish and send newsletters to lists of subscribers. Simplenews has a feature to send an email to a test user, I wanted to use this to see exactly how the newletters would look. I do much of my development from a local machine and I found that my test emails from my local machine were being incorrectly categorized as spam. Basically I couldn't receive any email which I sent. actual sending process of the email for you. This was very helpful because it helped move me toward a fix. After a lot of searching and trial and error I finally came to a solution. I didn't hit too many deadends along the way either, which was nice. After making this change I have had no problems sending Simplenew test emails from my local machine and they are no longer categories as spam. I have been receiving the test emails in less than one minute. Once I'm satisified that the test email renders as expected I migrate my newletter to a hosted webserver. Nice menus appear to output duplicate menus i.e. the same menu is output twice. This happens in certain configurations and can be difficult to fix if you do not know where to look. For example, in the image below, the menu item "Menu to Front" is output twice. This site is configured with 1 menu item enabled in the Primary Links menu. There is also a nice_menus block enabled which has its Source Menu Tree set to Primary Links. Nice_menus is working exactly as it should. The reason this happens is that the Theme is outputting the Primary Links menu and Nice_menus is also outputting the Primary Links menu. I know of two configurations that can fix this which will allow the menu to appear only once. 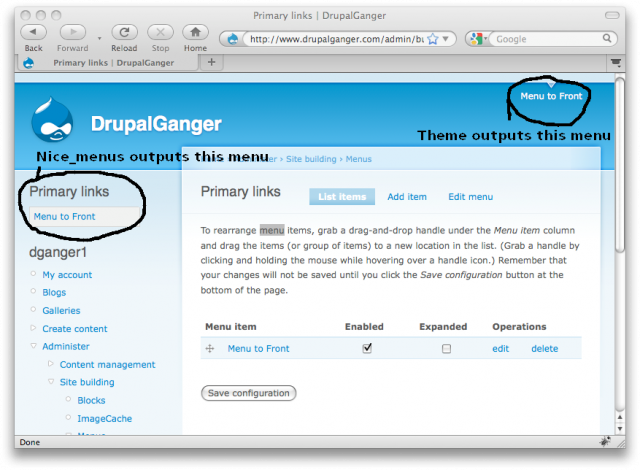 Method 1: Configure your Theme not to output the menu. In effect Nice_menus will be outputting your menu and the menu will appear only once. Method 2: You can create a new menu, a menu that your Theme does not natively output. You will then configure Nice_menus to output this menu. Click Add Item and then add your menu items. Under the Source Menu Tree select the new menu that you created in #3 above. I prefer method 2 above because not every theme will have the configuration option. It also seems more intuitive to keep the expected Primary Link settings as provided by the theme. If you look at any website today you may notice that many have links to archived content. I find this feature extremely useful because it is a very intuitive way to view content. Implementing a Monthly archive block in Drupal is very easy. In fact it took me only about 15 minutes to implement and to post about my experience. I followed the tutorial Drupal archive list. The steps are very easy to follow. You will need to do some minimal Views configuration and you need to configure the block to appear on your site. But that is all. I am very happy with my results and I think everyone doing this will be happy with their results too. The photo gallery on DrupalGanger was built with the help of Jeff Eaton's tutorial. The tutorial teaches a great way to display photos on a Drupal site. Now that I've used this photo gallery for a few months I highly recommend the tutorial.